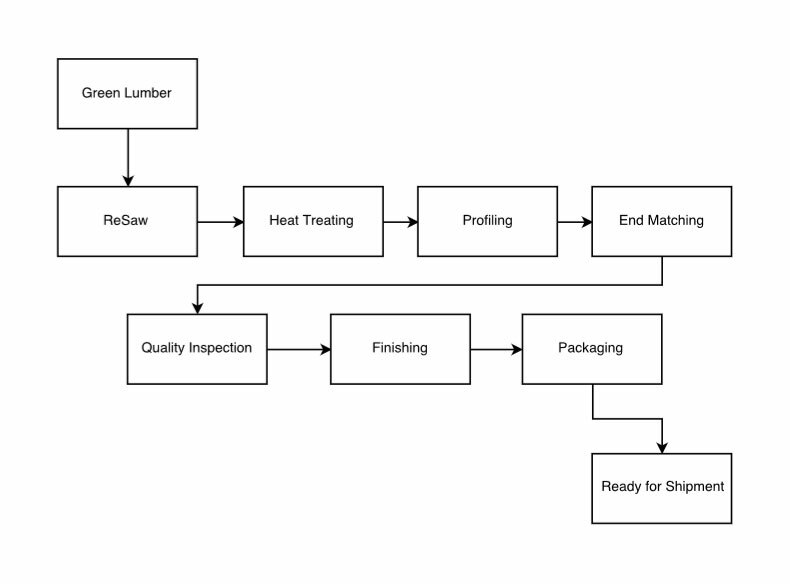 Process Workflow – Pine Profiles Inc. Raw unprocessed 2×4, 2×6, 2×8 wood pieces are brought to the factory in bundles. These are unloaded and depending on the type of final product requirement, go through different steps before being ready for shipment. If the final product needs to be Kiln-Dried Heat-Treated (KD-HT), it goes to 1 of 2 kiln units where the moisture content is reduced to between 8%–12%. Usually, the set standard for Moisture content of the wood pieces is anywhere under 18%, taking it down to 8%-12% helps add strength and increases load bearing. Furthermore, this reduces the chances of the wood shrinking & swelling later on after installation. Next step is profiling of the wood. This is the main bulk of the work being done to the products. 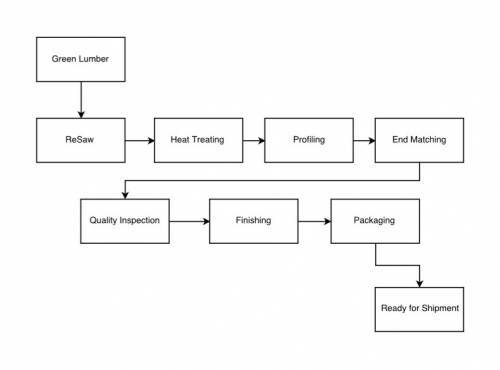 Profiling is the shaping and grooving of the wood depending on the type of product being made. The patterns being made include WP4, 116, 105, V4E, Edge & Centre Bead and many others. Our pattern grinder can produce custom designed patterns exclusively for certain customers. This is the process of making grooves on the ends of the boards. Their function is to keep the boards aligned and indexed to adjacent boards. This allows for a more level and flush fit once the products are installed. PineProfile Inc. is know in the industry for it’s high quality products and strict grading practices. Our graders are qualified and ensure that the products are sorted according to the different requirements of the products being run. The finishing process is based on the product requirements, sometimes the product are minor bundled as well as straight piling. Once ready, again based on customer requirement, we either package the bundles wrapping it using our own wrap or customer supplied wrap. This protects the products while it is transported. At this stage, the products are ready to ship and are either immediately loaded & shipped or stored, ready for pickup.